No Ordinary Day: Niece? Second cousin? Who cares - she's brand new! Niece? Second cousin? Who cares - she's brand new! 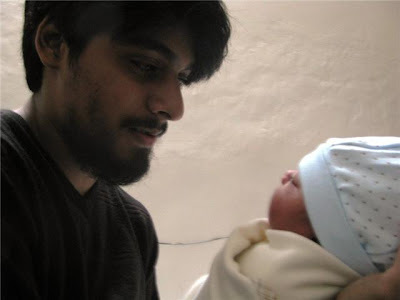 My cousin (one of very many, trust me) in India, himself barely more than a kid, just became a daddy!!! The baby is so new they haven't even decided on a name yet. I do hope they call her Sara, my very favorite name, that would've gone to the BabyBug if DaddyBoy hadn't preferred Aisha. But we have NO Sara's in the family, so I really hope they pick that. I don't usually post family pics, but this one is so sweet. The new daddy with his little critter, taken by the new daddy's older brother, who is himself due to fly to France in a couple of days for his MBA. He was hoping the baby would come before he left, and it did! No, coz I hid the baby. I'm still shy about stuff like that. You won't see you or me or our baby on this blog either. Mabrook! everyone.. what? you have more pics? pls. forward.